Diabetes is a long lasting disease which occurs due to insufficient levels of insulin to our body. About 25.8 million means 8.3% of the population of united states are affecting with this disease. People at any age may undergo this disease and the severity of the disease increases with time. Diabetes occurs mainly due to obesity. Often diabetes has different types. Mostly affecting diabetes is type 2. Type 1 diabetes disease affects only 5% of people whereas type 2 diabetes affects 95% of people. Diabetes, a major factor for causing strokes, heart diseases, blood vessel diseases, etc. Since prevention is better than cure, know the types of diabetes and follow the necessary diet to avoid diabetes disease. A group of metabolic diseases known to be Diabetes often called as Diabetes Mellitus or blood sugar. It is a chronic metabolic disorder caused due to defects in secretion of insulin levels. Glucose is the major component to provide energy to your body. This Glucose comes from the food that you take. Also, it was prepared by muscles and liver. Several hormones control the glucose levels. Hormones in our body send messages to all cells and among the cells. Pancreas is an organ which locates between stomach and spine that helps to produce a hormone called insulin. Insulin hormone helps to carry glucose through blood to all cells and tissues in our body. The excess glucose is stored in cells in the form of glycogen. Hence, when the pancreas doesn’t make insulin, this glycogen breaks down into glucose to provide energy to tissues or cells. Sometimes pancreas doesn’t make insulin and receptors are not responded to insulin which leads to a disease called Diabetes. 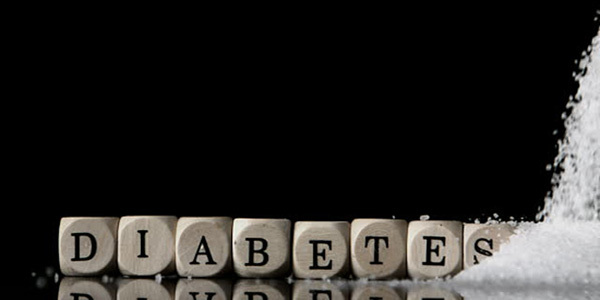 Diabetes is a chronic condition occurs due to high levels of glucose or sugar in the blood. Do you know how many types of diabetes? Diabetes is broadly classified into two types like Type-1, Type-2, Gestational and Other types of Diabetes. Other types of diabetes occur due to many factors like medications, hormonal changes, etc. People can get any diabetes with an addition to other forms of diabetes. People at any age can get diabetes. Also, both men and women can experience this equally. Type 1 diabetes definition: Type 1 diabetes is also known as Juvenile-onset diabetes. This Type-1 Diabetes occurs due to less production of insulin. When our immune system attacks the pancreas which produces insulin, this disease will happen. In this type of Diabetes, the immune system develops the antibodies which attack the beta cells of the pancreas and affect the body tissues. These antibodies are developed due to exposure to certain viral infections and environmental conditions. The most common antibodies developed in a body include anti-glutamic decarboxylase, anti-insulin, anti-islet antibodies. The Type one diabetes disease begins in childhood & commonly seen in adults having age below 30 years. However, adults also face this type of Diabetes in some cases. Out of all Diabetes patients, 10% people will encounter this Type-1 Diabetes disease. Since this diabetes occurs due to insufficient insulin, it is also termed as insulin-dependent Diabetes. Hence the people who have this type of Diabetes may take the insulin injections or food that contains insulin. Type 2 Diabetes Definition: The Type 2 Diabetes often called the Adult-onset Diabetes or NonInsulin-dependent Diabetes disease. Also, Type two diabetes is known as Diabetes Insipidus. In this type of diabetes, a person may feel excessive thirst and excretes a large amount of urine. 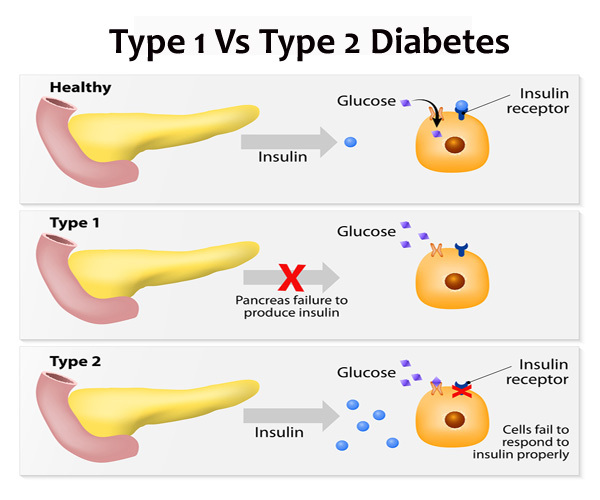 In type-2 diabetes, our body makes insulin, but it is not enough to process glucose. Hence, this disease begins at the stage of insulin resistance. It is the condition when liver, fat tissues, and muscles don’t use insulin to convert into energy. With an increase in insulin resistance condition, pancreas in our body doesn’t produce insulin. Also, lead to the decline of formation of beta cells which results in uncontrollable glucose level. Thereby the cells become insensitive to the insulin. Hence, patients at this situation may require insulin therapy. Do you know what percentage of Diabetes patients have type 2? About 90 to 95% of people who are affecting with Diabetes must of have Type two Diabetes. Mostly this diabetes type 2 is seen at any age but more in adults having an age of above 40 years. But now this disease also occurs in children and adolescence. The main causes associated with this disease are overweight, poor eating habits, and lack of exercise. In fact, about 7% to 10% of type 2 diabetes mellitus occurs due to overweight. Studies prove that chances of diabetes type 2 may increase for every 20% rise in overweight or obesity. If the degree of obesity is increased, the symptoms of type 2 diabetic disease may worse. You can manage this kind of diabetes with proper diet, exercise, and anti-diabetic medications. 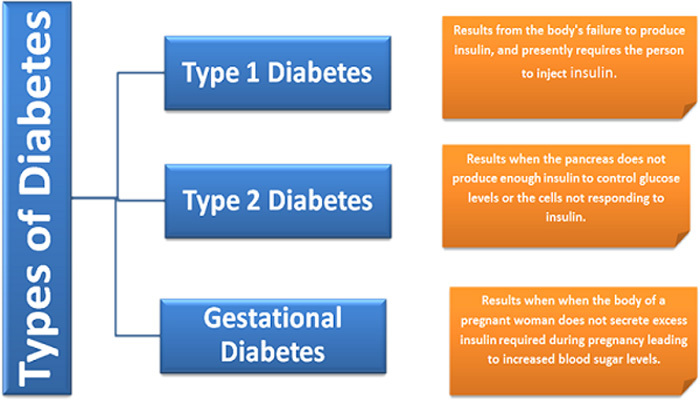 Gestational Diabetes is one of the kinds of Diabetes often called type 3 diabetes. It is a temporary condition that occurs during pregnancy. About 2% to 10% of all pregnant ladies are affecting with this Gestational Diabetes. The hormonal changes at the time of pregnancy may lead to an elevation in blood sugar. This blood sugar elevation is known as Type 3 diabetes or gestational diabetes. The symptoms of this disease will last once the person gives birth to a child. About 35% to 60% of women with gestational diabetes may also encounter type 2 diabetes for next 10 to 20 years. Mainly this disease is shown in women with lack of insulin and due to overweight after delivery. Hence, women having gestational diabetes must take oral glucose tolerance test for about six weeks after delivery to reduce the risk factors of Type 3 diabetes. Gestational Diabetes is completely curable, but a proper management and keen supervision are necessary during pregnancy. But you should monitor blood sugar levels, maintain Dietary changes, and insulin levels. About 35% to 60% of women with gestational diabetes may also encounter type 2 diabetes for next 10 to 20 years. Mainly this disease is shown in women with lack of insulin and due to overweight after delivery. Hence, women having gestational diabetes must take oral glucose tolerance test for about six weeks after delivery to reduce the risk factors of Type 3 diabetes. Gestational Diabetes is completely curable, but a proper management and keen supervision are necessary during pregnancy. But you should monitor blood sugar levels, maintain Dietary changes, and insulin levels. In type 1 Diabetes, certain antibodies develop in our body which kills beta cells locates in the pancreas responsible for insulin production. The symptoms of type 1 diabetes start either in childhood or young age. It cannot be cured permanently. On the other hand, in Type 2 diabetes, our body still produces insulin but not do not respond to this due to insulin resistance. Type 2 diabetes disease do not show any symptoms at an initial stage and become worse at later stages. Unlike Type 1 diabetes, type 2 diabetes has cured. With some weight loss and daily physical exercise can prevent this type 2 diabetes disease. Both these types of diabetes has same symptoms but the occurrence of time may change rapidly. Must read: How to improve metabolic rate naturally? Some diabetes occurs due to some receptors in our body which don’t respond to insulin. Genetic mutations like mitochondrial effects may alter the beta cells function. The other types of Diabetes occur due to many causes and combination of various forms. Other specific Diabetes includes prediabetes, secondary diabetes, hormonal changes, and medications. Prediabetes occurs due to high blood glucose levels. In this condition, persons may experience elevations in blood sugars even high or low. The people who have prediabetes may also have a chance to get type 2 diabetes, heart stroke. With some changes like weight loss, physical exercise may help to prevent type 2 diabetes disease. Among the Diabetes types, secondary diabetes is one. It occurs due to damage of pancreatic tissue responsible for the formation of insulin. Intake of alcohol and other toxins can cause inflammation to pancreas which leads to a disease called Chronic Pancreatitis. Also, this secondary diabetes is caused by trauma and pancreas removal. Several hormonal disturbances can lead to blood sugar elevation. Hormonal disturbances include excessive growth of hormones and Cushing’s syndrome. In acromegaly, a pituitary gland causes overgrowth of hormones which leads to hyperglycemia. Also, in Cushing’s syndrome, the adrenal glands is responsible for producing an excess amount of cortisol which can cause blood sugar elevation. Certain medicines may worsen the condition of Diabetes. Particularly, using steroid medications like prednisone can cause Diabetes disease. Also, medicines used for the treatment of HIV-AIDS cause Diabetes Mellitus.